A long flight can seem daunting, but with hours of entertainment options, impressive food options, and amenities to suit any flyer, it doesn't have to be. 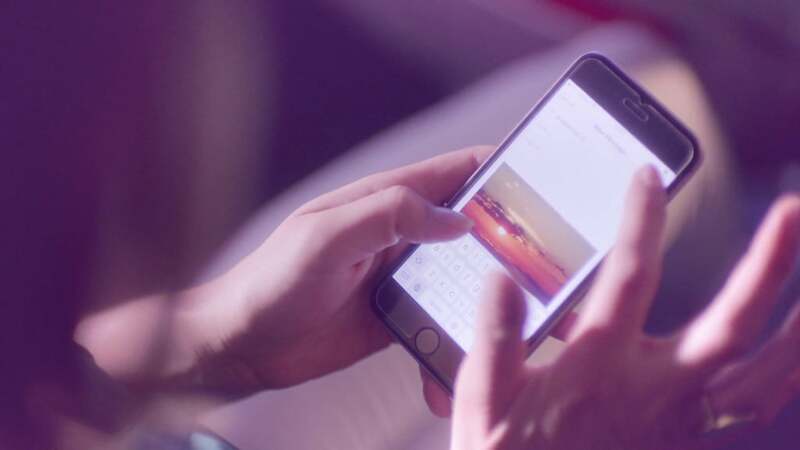 We've partnered with Emirates Airline to share why their unique offerings can make time in the air something to truly look forward to — no matter how you like to spend your time in the air. No matter how well versed of a traveler you are, there's one thing regular jet-setters and first-time flyers have in common: they struggle to stay occupied on board. But while hours of airtime are never anyone's favorite part of a trip abroad, we found three editors with varied flying styles who unanimously agree it can be an enjoyable way to kick off your adventure. Ahead, they reveal how to prep like a frequent flyer and take advantage of every amenity that will make your experience a total pleasure. Pack the right carry-ons: "To ensure I have the most pleasant experience on board, I add to my tote a cozy sweatshirt (I tend to always be cold) and my most comfortable, noise-cancelling headphones to block out all sound within the cabin, a mini spray mist to refresh my face, and a travel-size pack of makeup wipes if it’s a red-eye." Stay entertained: "I try to tune out everything around me, recline my seat, and relax. First, I browse through all the entertainment options, and use the onboard technology to make a playlist of everything I want to watch. Taking in as many movies as possible is the goal. I start with the best new releases and try to end the flight with something that really sets the mood for my trip, like a movie set in a similar location. I basically only pause to speak to flight attendants and for bathroom breaks." Take advantage of the amenities: "I'm a TV and movie junkie, and there’s never enough time to watch everything I want at home, so I love taking advantage of that on long flights. An airline with a wide selection of new releases is a dream because I will literally watch from takeoff to landing. 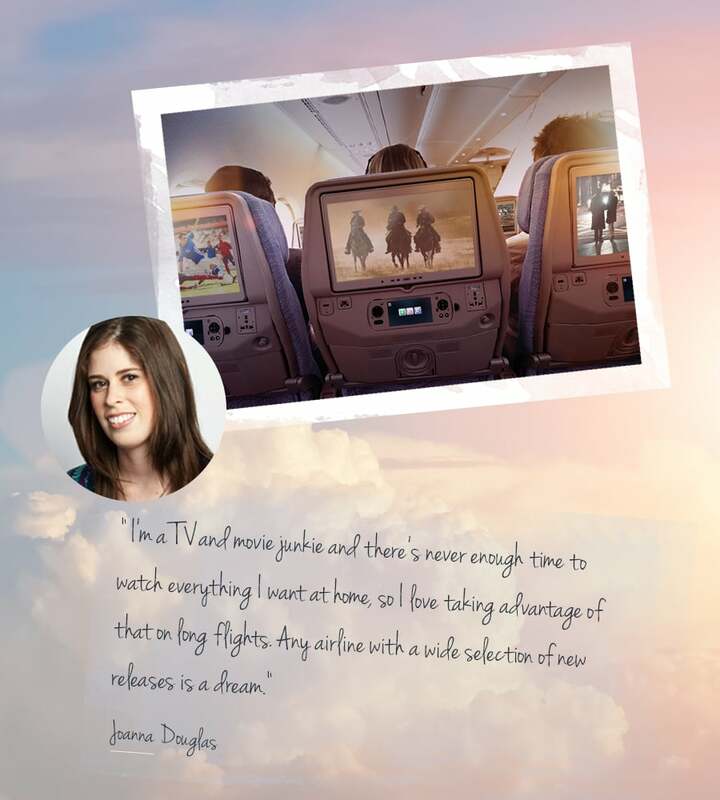 Good viewing snacks and comfy, roomy seats definitely enhance the experience." Bring along the essentials: "Before a flight, I stash all of my skin care essentials in a makeup pouch in my purse. I pack makeup removal wipes, moisturizer, a sheet mask, a thick lip balm, hand cream, and a bit of makeup." Turn your seat into a pop-up spa: "Once on board, I wait for the lights to dim because that's when I begin my skin care routine. Long flights can severely dehydrate your skin, so I do my best to prevent the damage. I take off my makeup, apply a sheet mask or moisturizer, and then slip on a sleeping mask from my seat's amenity kit when I'm done. To make the flight go by faster, I also like to recline my seat and take a nap. 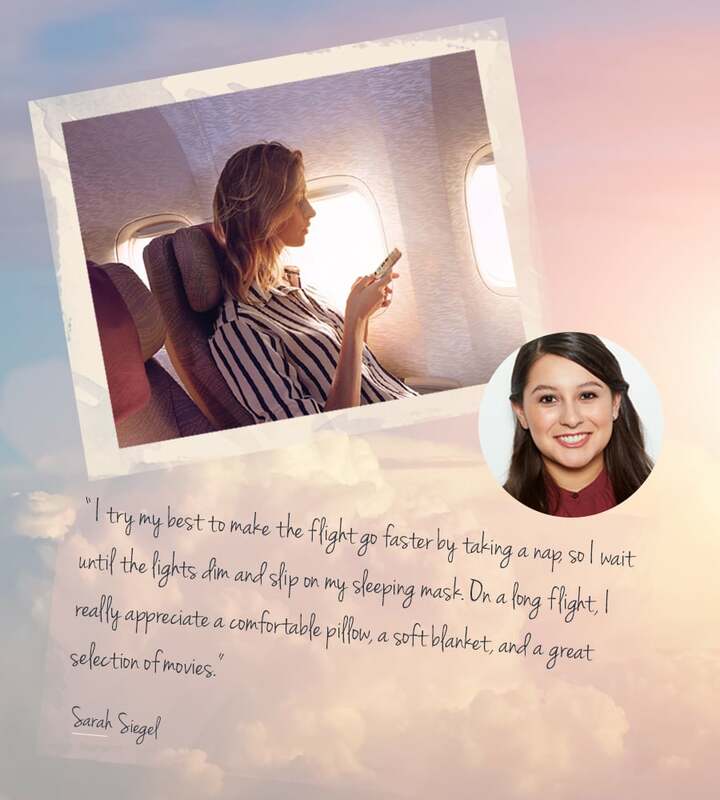 Indulge in the onboard offerings: "On a long flight, I really appreciate spacious legroom, a comfortable pillow, and a soft blanket. And if I can't sleep, I catch up on all of the great films I've yet to see." Go minimalist with carry-ons: "I'm a pretty easy traveler, so as long as I have a book for while I'm on the flight and my iPhone to keep me company while I wait to board, I'm all set. However, I always have a charger, book club book, headphones, and makeup for prelanding touch-ups." Make a game plan: "Before any flight, I make sure that I know exactly where everything is in my carry-on bag, which is packed all of my important essentials for the trip. The last thing I want to do from my seat is rummage through my bag for headphones or a notebook, so I like to keep those handy as well. I start reading or listening to music as soon as I board, even if it's awhile before we start moving, to ensure that I'm as relaxed as possible for takeoff." 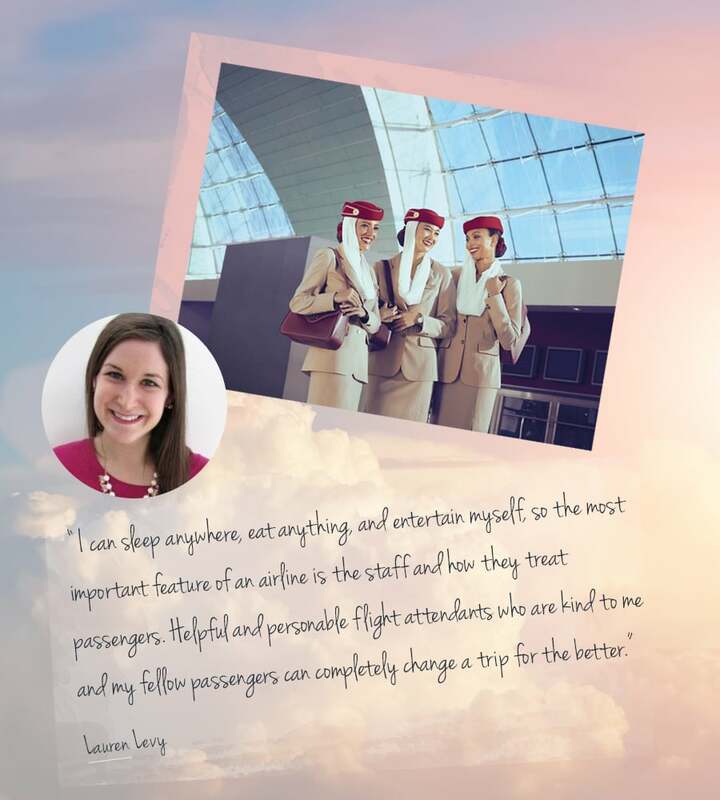 Befriend the flight attendants: "I can sleep anywhere, eat anything, and entertain myself, so the most important feature of an airline is the staff and how they treat passengers (aside from safety). Helpful and personable flight attendants who are kind to me and fellow passengers can completely change a trip for the better. That, and the free wine and spirits."